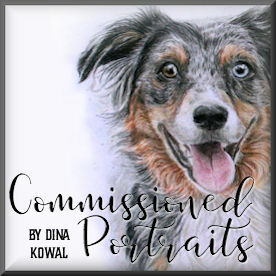 Dina Kowal Creative: Crazy for Cocoa blog hop! Crazy for Cocoa blog hop! Welcome to the Sweet 'n Sassy Stamps Crazy 4 Cocoa blog hop! We all adore Cocoa and thought it would be fun to showcase him all month long. 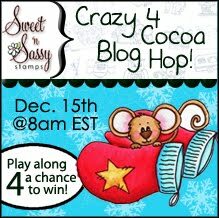 Today, as part of the fun, the Sweet 'n Sassy Design Divas have joined together with a few of the talented Sweet 'n Sassy Digi Challenge ladies to bring a great Cocoa Mouse blog hop to you! If you just happened on the blog hop because you're a regular reader of my blog, and you'd like to view the entire hop, you can start back at the Sweet 'n Sassy Blog - you'll find a full list of participants there, and all the details you need. If you're already hopping and you arrived here from Makiko's blog, you're doing just fine. And there's MORE!!! We want YOU to hop along with us! All you have to do is make a card or project featuring Cocoa Mouse and add your direct link to our linky tool below. One participant (drawn at random) will win their choice of ONE free Cocoa Mouse clear stamp set or FOUR free Cocoa Mouse digis! You have until Saturday, December 17 at 11:30 PM EST to add your direct link...go get stamping! From here you'll be moving on to Taylor Usry's blog - hope you're enjoying the hop so far!! Look how sweet! I love how you focused in on Cocoa's face. The way you layered your dies with the ribbon through it is just beautiful! Great card! Absolutely amazing! 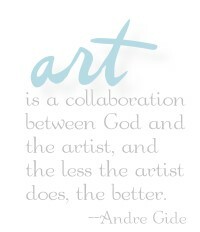 You are a true artist! Besides the sweet image, I love the simple color scheme - I am totally craving one of Cocoa's cookies! Seriously Dina, this is like a little work of art! The soft colors you used on Cocoa, the lacey border, ribbon...Beautiful! that cookie looks so real!!! Amazing little 4x4 goodness you created. Wow. What can I say, Dina...your Cocoa card is sooo sweet! Love the warm, chocolaty colors and that fabulous layered border treatment! The perfect coloring and row of pearls is just the icing on the cake! Awesome card Dina..Gorgeous colors and coloring and love how you did that border. LOVE the way you used light ink for your sweet Cocoa on the inchie, Dina - the close up shows the fabulous detail. Your card makes me want to go bake chocolate chip cookies, it's delicious! Dina, your coloring is incredible. That cookie looks so real. PS - I am now following your blog. Amazing idea to use a close up of this digi! I love how you laced your ribbon and bow, and the pearls are perfect! Wow Dina this is absolutely yummy! I love how you focused on just part of the image and the colors and ribbon/border treatment are perfect! This is an amazing, cute and stunning card! I love the little mouse Cocoa! A wonderful card, Dina. Perfect detailing. Your card is just adorable! I so love the tip about the die! This is just fantastic. I love the design - I love the colors and I love what you did with the lace die and ribbon. Wonderful card! Cute image too. WowZers, Such a lovely card. STUNNING! You always do such a fabulous job coloring images, and this card is no exception. I love the layered diecut border with the ribbon woven through it, too! Wow! This is so pretty Dini! I love the look of the image... so beautiful!